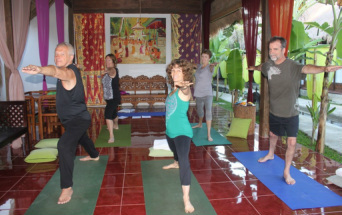 May 2013 Bali adventure cultural tour and daily yoga! Akhila Bonnie Murphy RYT, owner of Dragonfly Yoga collaborated with Bali Tour Guide, Charlaine Ramsay, Owner of Pacific Island Adventures to provide a wonderful 10 day Bali tour including a daily yoga class each morning! Bali is an island filled with the beauty of nature, arts and influence of Hindu culture. Yoga shares its roots with this culture, so adding yoga to our tour was a wonderful complement to the Bail island experience. "It was truly an unbelievable gift to be able to offer daily classes at both of our destinations: Ubud and Sanur Beach. We offered a gentle yoga class suitable for the beginner and intermediate level practitioner. The practice of yoga* is more than movement of the body. Yoga means union, and we experienced bringing body, mind and spirit into union within the inspirational environment of Bali. Being on vacation is exciting - filled with new experiences, sights and sounds. Yoga enhanced our travel experience by bringing our emotions and busy mind into a more harmonious state. We were able to bring clarity of mind and a healthy heightened awareness into each day!" click here for Pacific Island Adventures details and itinerary. * You do not have to be flexible to do yoga! Classes are for all ages and body types.